The acronyms tool uses the first few letters of your keywords and combines them in different ways. many global companies operate successfully under a name which is an acronym or an abbreviation. The Acronyms tool from the Name Factory creates abbreviations from your keywords that can be used as business or trademark names. Depending on your settings, the letters combined are either the first characters, the first two characters or the first syllable of each word. You will get various types of results with the Random Mix option. Use this NameRobot tool to see if your name or keywords can be turned into original, melodic acronyms. The advantage: Your name sounds like an invented name, but still contains meaningful elements. Another approach is to specifically search for abbreviations which in turn carry their own meaning. For example, the name of the entry-level programming language BASIC* stands for Beginner's All-purpose Symbolic Instruction Code. Test the Acronyms tool now - for free! Give NameRobot's Acronyms tool a try and test it for free. You can perform up to five checks with the tool to see how it works. 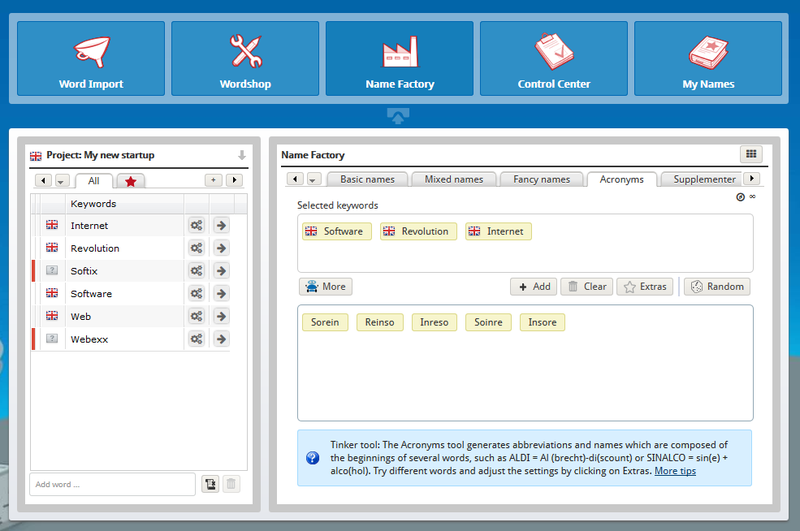 Enter several words and find acronyms and other types of abbreviations with just one click. Go to the Acronyms tool in the Name Factory right now to test it out! If you don't have a NameRobot account yet, simply register and start looking for a name!